Back in the Stone Age, mankind was a little dumb - our tools consisted of pointed sticks and sharp rocks. Then, when we learned metalworking, we joined the Bronze Age. We made real tools, established trade routes, and developed writing. Then came the Iron Age, wher ... (see full details) (see specifications) #IRAIA5730. Back in the Stone Age, mankind was a little dumb - our tools consisted of pointed sticks and sharp rocks. Then, when we learned metalworking, we joined the Bronze Age. We made real tools, established trade routes, and developed writing. 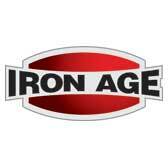 Then came the Iron Age, where mankind progressed into building empires and civilizations. While we can't promise you these Iron Age Men's IA5730 Brown Leather Internal Met Guard High Ridge EH Steel Toe Boots will allow you build an empire, they will let you take some really awesome hikes. What makes these Iron Age boots superior to lesser Bronze or Stone Age footwear? How about the steel toes that meet ASTM F2413 standards? They'll keep you safe from impacts and compression. And to double your safety, throw in the Poron XRD internal metatarsal guards. Poron, an open-celled polyurethane, is a material that offers incredible shock-absorption and cushioning for the tops of your feet. These men's boots also meet the electrical hazard rating, which means they'll prevent shocks around open circuits. Your Stone Age friends will be jealous. Should you somehow manage to build an empire, you'll need to be comfortable walking around in it. Emperors shouldn't have sore feet. That's why these met guard boots come with removable EVA cushion inserts with sponge rubber heel wedges. EVA is a soft, light, and flexible material that'll cushion your feet with each step. The sponge rubber heel wedges soften impacts, so you can stride all day without getting weary. The EVA cushion midsoles add another layer of fatigue-fighting comfort, while the moisture-wicking nylon mesh lining helps keep your feet drier and cooler on those empire-spanning hikes. The brown, leather uppers on these EH boots help prevent abrasions from rough trails and brambles, but it's the outsoles that really shine. These dual-density, rubber-bottomed outsoles have good slip-, oil-, heat-, abrasion-, and chemical-resistance, so you'll have durable and safe footing in a wide variety of environments. It even holds up to metal chips well. Show that Bronze Age hiking footwear who's boss in a pair of Iron Age Men's IA5730 Leather Internal Met Guard High Ridge Steel Toe Hiking EH Brown Boots. Iron Age Boots: Men's IA5730 Steel Toe Met Guard Brown Hiking Boots is being added to your cart.